Driving home from a screening of the ravishing new Israeli film Fill the Void, I caught sight of a young man in full Hasidic garb, trying to coax his toddler son across a busy Los Angeles street. My first thought was, "He's a boy himself, barely old enough to be a father, and they both look so pale." My second was, "I wonder what his life feels like?" This is the more open mindset that director Rama Burshtein asks from audiences going into her first feature, a love poem to the ultra-Orthodox world as seen from within. An insider by choice rather than by birth, Burshtein grew up in New York and only committed herself to Hasidic Judaism while at film school in Israel. Since then she has devoted herself to nurturing a small but growing cinema of Orthodox (Haredi) Judaism, especially for women. That's pretty novel right there. Filmmakers tend to be a secular if not downright anti-conservative lot, which may be one reason why the handful of movies set in a Jewish religious milieu have essentially been hatchet jobs. 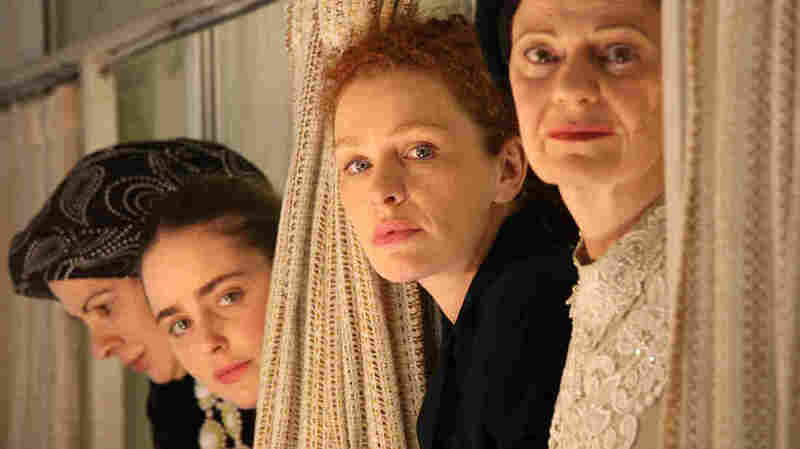 Boaz Yakin's A Price Above Rubies (1998) and Amos Gitai's Kadosh (1999), both made by men, latched ferociously on to the second-class and abused status of women in Orthodox Jewish society, and saw nothing else. Burshtein refuses to engage with the culture wars that flare fiercely between secular and religious types in Israel; in fact she's trying to avoid types of any kind, which may be why secular audiences and critics have embraced her rapturous depiction of a community living its life, more separate from than at odds with the society beyond. Fill the Void is set in Tel Aviv (where Burshtein lives) rather than in Jerusalem, where most Israeli ultra-Orthodox live. But the outside world might be anywhere, for all the time the movie spends beyond the cloistered walls of a watertight community mobilizing to resolve an internal crisis. No one feels oppressed here, or tries to escape. We meet Shira (Hadas Yaron), a dewy 18-year-old beauty, in a lather of girlish excitement after she catches a glimpse of the side-curled young Hasid who's been picked out as her future husband. But Shira's joy at finding her beshert doesn't last. When her older sister dies in childbirth, the wedding is put on hold. Handsome and thoughtful, Shira's sister's widower (Yiftach Klein) is nonetheless not her first choice for a husband — which may not make a difference in the end. Then Shira's mother, terrified of losing the sister's newborn baby when the widower, Yochay (Yiftach Klein), considers marrying a widow in Belgium, sets about engineering a match between between Shira and Yochay. Desolate enough at having her own hopes dashed, Shira is downright paralyzed by the ethical and emotional implications of marrying her beloved sister's husband, whom she has loved as a brother. Other complications intrude to stack the deck against an orderly transition to a settled life; none of them, though, involves a direct challenge to a social order that many secular people argue consigns women to secondary roles as helpmeets. And it's true that the stakes are low here. Shira's dilemma may be agonizing for her, but it involves no violation of Jewish law, threatens no status quo. The community's kindly rabbi implores her to consult her own feelings. One wonders how he would respond to a request to take a year off to travel by herself, or to train as a rabbi. In light of the recent violent protests among ultra-Orthodox men (and women) against women who claimed the right to pray as men do at Jerusalem's Western Wall, some would call Fill the Void a roaring case of special pleading. And perhaps Burshtein does take a willfully rosy view of women's standing within the Haredi community. But if she may be willfully blind to politics, she excels at setting before us, in passionately intimate detail, a world to which she is devoted — and one in which women are placed front and center. Ambience is everything in this director's gorgeous scene-setting. There's nothing remotely monkish or drab about the lavish physicality and rich lighting that infuses a sexually modest subculture with sensual pleasure and — yes — romance. In one achingly lovely scene, Shira squeezes out her grief in the plaintive notes of an accordion as Yochay sways in a hammock, his baby slumbering peacefully on his chest. Elsewhere a richly soulful Hebrew rendition of Psalm 137 ("If I forget thee, O Jerusalem ...") underscores the transformative power of communal ritual, whose central premise — act, and the feelings will follow — guides Shira toward a decision. There's nothing pat about this: In the final shot of the movie, on her wedding night, a young woman stands with her back against a wall. What is that look on her face? Is it doubt about the choice she's made? Fright? Or awe before the mystery of her own, and all, existence?